Jose Mourinho pointed the finger at his attacking players after Manchester United's 1-1 draw with Wolves. In front of former manager Alex Ferguson, who was back at Old Trafford for the first time since suffering a brain haemorrhage in May, United produced a disappointing performance and Wolves left with a deserved point. Fred gave the hosts the lead against the run of play in the 18th minute, but Joao Moutinho brought Wolves back on level terms early in the second period with a fine finish. Clear-cut chances were hard to come by for United thereafter, and Mourinho was angered by the displays from the likes of Romelu Lukaku, Jesse Lingard and Alexis Sanchez. "I think it's a fair result," Mourinho told Premier League Productions. "They deserve the point and I think we deserve the punishment of only one point. "They started better, more aggressive, more intense. I don't know why, but they were more motivated and for 10, 15 minutes they showed the good team they are and were in control. "We had a slow start in the second and they scored, then they defended with a lot of people. "Honestly, I was expecting more from my attacking players. [There was] not enough creativity, movement, dynamism, so we made it quite easy for them to cope with our supremacy. "Then we tried to go direct and cause some problems, but overall we don't deserve more than this. "[The performance] surprised me. You can see the way we conceded, the ball was lost in midfield. They [Wolves] were fresh as they didn't play in midweek. We know how Moutinho and [Ruben] Neves play, they don't give us much time to play. But honestly, our performance wasn't consistent, dynamic, creative." 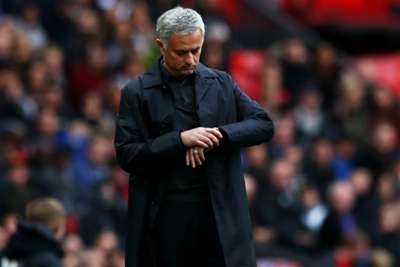 Mourinho introduced Juan Mata, Anthony Martial and Andreas Pereira from the bench in the final half-an-hour and all looked sharp, but the manager was in no mood to praise them. "When they came on the score was the same, it didn't change anything for the better," Mourinho said of his substitutes. "The improvement [towards the end] is natural, for home team to go stronger in last part of the game, but I think our attacking players weren't creative enough."